Assisted suicide was a hot topic in 2014. Last November Brittany Maynard, a 29-year-old terminal brain cancer patient, ended her life under Oregon's "Death with Dignity Act," and the video explaining her choice amassed more than 9 million views on social media. Today, according to the Death with Dignity National Center, mentally competent, terminally-ill adult residents of Oregon, Washington, and Vermont can "request and receive medication to hasten their death, [which] is one of many end-of-life care options available." Among these options, however, one would never consider using an amusement park ride to do the deed. 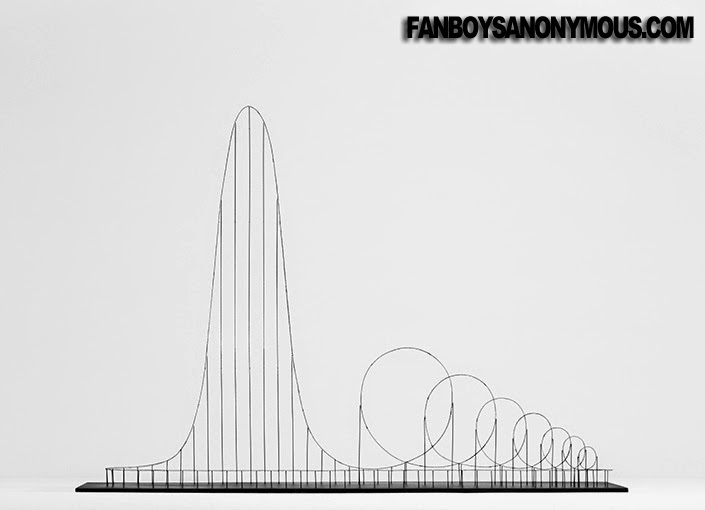 Model of the Euthanasia Coaster. Julijonas Urbonas, a Ph.D. student in Design Interactions at the Royal College of Art in London, designed a plan for a roller coaster that "humanely—with elegance and euphoria—takes the life of a human being." 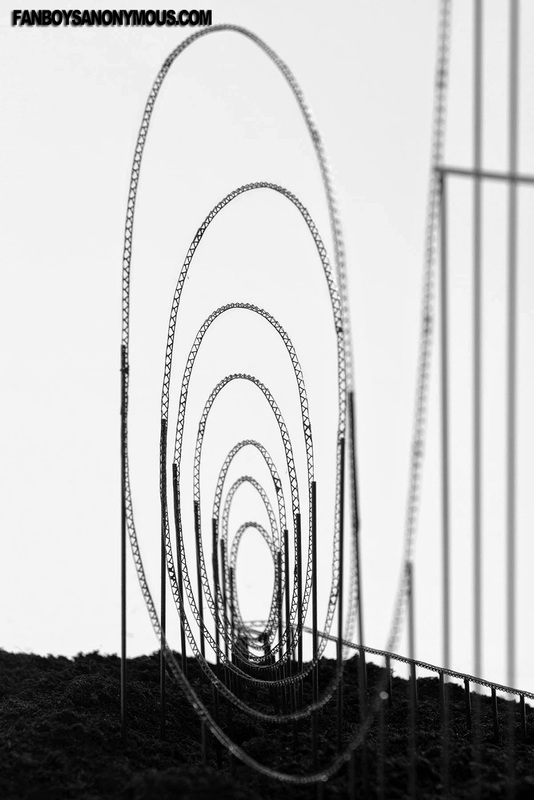 Named the "Euthanasia Coaster," the hypothetical rides uses concepts in mechanical engineering, airspace medicine, and gravity to create intense motion that ultimately would deprive the brain of oxygen, causing the rider to expire. Before meeting his or her death, however, the rider would experience a range of sensations "from euphoria to thrill, and from tunnel vision to loss of consciousness,"which is commonly known as G-LOC, or acceleration gravitationally induced loss of consciousness, and often affects fighter pilots of high performance or aerobatic aircraft and astronauts. Seated, harnessed with a health monitoring system, and strapped to the seat of a single-seat coaster vehicle, you are slowly towed to the top of the drop-tower. It takes a while, as the ride is about half a kilometre long! Hence, you have a few minutes to contemplate your decision and your life in retrospect. You even find enough time to adapt to the height and get through a series of imaginary fatal falls, while realising that the objects on the ground are getting smaller. Slow lift is an important illusion that intensifies the perception of height. The slightest movement of the car triggers drumming heartbeats and tests your decision (...) If this test has not changed your mind yet, then at this point you have no choice but to submit yourself to the very last fall. Yet you still have a few minutes for the last words and goodbyes, or just enjoying the exhilarating bird’s-eye view of the surroundings. You relax and press the FALL button (...) Your body spins around the heart while you fall (...)The scooting gust of wind, goose bumps, suspension of breath, and vertigo — a set of experiences comprising a sort of fairground anesthesia. (...) You feel your body as if supported by an air pillow. Just after this point, the track smoothly straightens forward, entering the first loop of the coaster, a continuously upward-sloping section of the track that eventually results in a complete 360-degree circle, completely inverting the riders at the topmost part (...) Breathing requires more effort, as the ribs and the rest of the internal organs are pulled down, which empties air from the lungs. But most probably you are already unconscious, as this force rushes the blood to the lower extremities of the body, thereby causing oxygen deficiency in the brain. It is exactly this cerebral suffocation, also known as cerebral hypoxia, that is going to kill you. If you are still conscious, you are more resistant to the high g-forces than the majority of people, but don’t worry (...) the second loop will definitely do its job. In the meantime, if you are lucky, or, rather, g-force-resistant enough to be awake, your vision may blur, lose colour (greyout) and peripheral sight (tunnel vision), or even disappear completely (blackout), together with hearing. Eventually, this experience—accompanied with disorientation, anxiety, confusion, and, most importantly, euphoria—is crowned with G-LOC (g-force induced loss of consciousness), during which the body is completely limp, and vivid bizarre dreams occur, such as being in a maze and unable to get out, or floating in a white space, not knowing who you are, why you are here, etc. (...) The rest of the ride, six or five loops, proceeds with your body being numb, ensuring that the trip ends your life. You die, or, more accurately put, your brain dies of complete oxygen deprivation, a legal indicator of death in many jurisdictions. The biomonitoring suit double-checks if there is a need for the second round, which is extremely unlikely, as the result is guaranteed by seven-fold repetition. Interested in seeing what this G-LOC deal actually looks like? Take a look at this compilation of pilots going through their G-force training. What do you think? Would ever see this becoming a reality in a near future? Let me know by leaving your comments below!